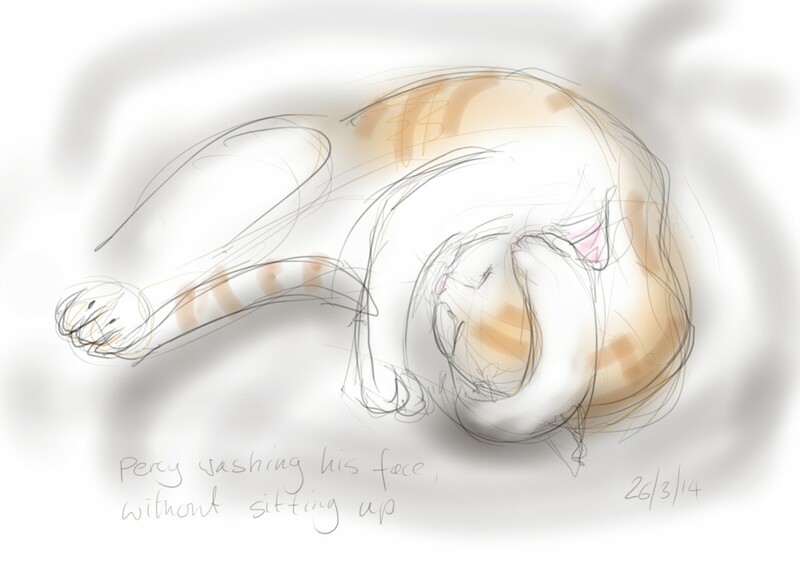 Percy Cat, washing his face without in fact bothering to sit up. I am not sure this was an entirely effective procedure but it looked cute. About time there was an ‘action shot’ of Percy, a cat mostly given to sleeping, though just occasionally barrelling around at high speed. This entry was posted in Cats and tagged art, cat, cat washing, digital sketch, drawing, ginger and white, illustration, Percy Cat, phone sketch, samsung galaxy note 3 on March 26, 2014 by Nancy Farmer. Your drawings are fabulous, Nancy! You seem to effortlessly capture the cats…I am very envious of your style. I am also a Somerset girl! Originally from Glastonbury.